iTrulyCare is a free and simple social event site that is built around locality with easy geo based search and category filtering. You can easily find and support a variety of events that you truly care about in your area. 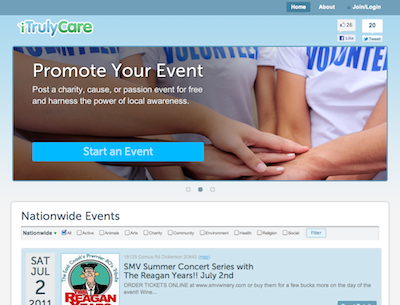 If you are sponsoring or holding an event then iTrulyCare offers extremely easy, elegant event posting with social integrations. We built iTrulyCare for the enablers and we want you to get the best possible outcome supporting your next cause or passion. Free, Local, Great Looking Event Listings, Easy search.